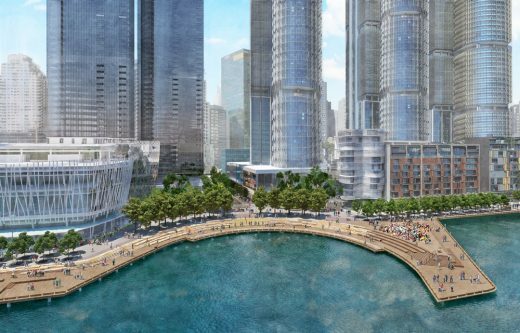 Grant Associates’ designs for two-hectares of public realm at Barangaroo South have been revealed, as the next phase of Sydney’s landmark waterfront development is submitted to planners. 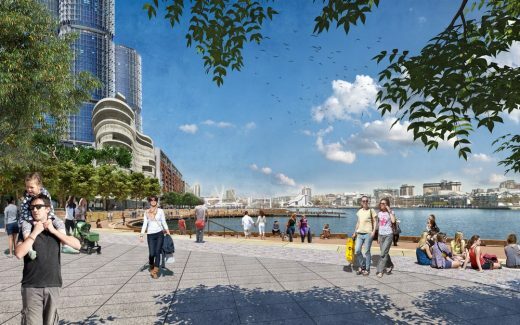 A new harbour cove, a one-hectare public park, an expanded waterfront walkway and a public pier are all key features of Grant Associates’ designs for the public realm at Barangaroo South, a 7.5 hectare, mixed-use scheme being developed and delivered by global urban regeneration specialist Lendlease. UK and Singapore based landscape architect Grant Associates aims to integrate Barangaroo South’s stunning waterfront location with a range of public spaces. 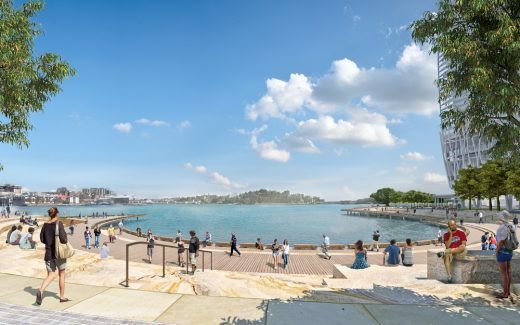 These will see the former industrial container terminal completely transformed into a pedestrian friendly area with open views across Sydney’s harbour. 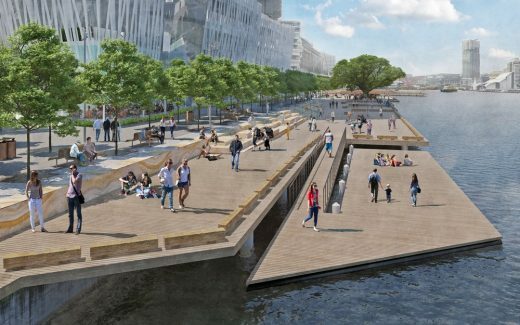 Designs include Waterman’s Cove and a fully-accessible amphitheatre-style boardwalk on the water. The new public realm also features the one-hectare Hickson Park that will provide a green link from Sydney’s Central Business District into the heart of Barangaroo’s retail and dining precinct, which is adjacent to the slender new residential towers designed by the internationally acclaimed architect Renzo Piano. There will also be an extension to Wulugul Walk around the Crown Sydney Hotel Resort. Lendlease will shortly lodge a Development Application with the Department of Planning and Environment, which will be available on public exhibition as part of the planning process. 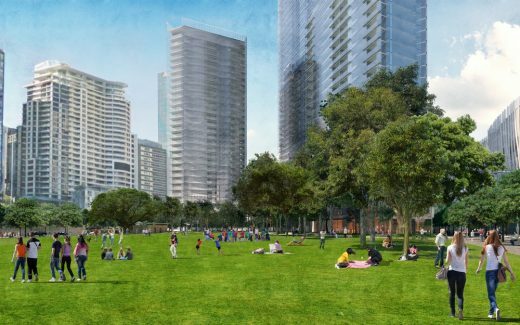 The new park and associated public space is anticipated to open in 2021. Barangaroo South. Lendlease was selected as the Developer of Barangaroo South by the Barangaroo Delivery Authority in December 2009. Barangaroo South comprises Sydney’s new financial services hub, International Towers Sydney, waterfront apartments, and more than 60 new cafes, restaurants and shops, all of which are open for business and attracting thousands of people every day. Upon completion, Barangaroo South will also be home to Crown Sydney Hotel Resort and three residential towers, One Sydney Harbour, as well as two hectares of public space for everyone to enjoy. Barangaroo Reserve. This six-hectare naturalistic headland park opened in August 2015 and has been visited by more than 1.8 million people to date. Built using 10,000 sandstone blocks sourced from the site and planted with 75,000 trees, plants and shrubs, this green, open space boast a mix of walking and cycling trails, picnic spots, lookouts and the natural amphitheatre of Nawi Cove. Central Barangaroo. Sitting between Barangaroo Reserve and Barangaroo South, Central Barangaroo will be the public heart of Barangaroo. The development will combine civic and cultural attractions with recreational, residential, retail and commercial uses as well as a harbour front public domain to deliver an exciting and unique range of public and cultural activities stimulating all those who experience it. The Barangaroo Delivery Authority is overseeing the entire project on behalf of the New South Wales Government.